Coach Burke Anderson supports his swimmers all season long, including at state competition. My friends love the Capital High School Swim Team. It’s a close knit group with varying skill levels who all know what it means to say “your team is your second family.” A huge reason for this is the hands-on, family-first coaching style of girls’ team head coach and boys’ assistant coach Burke Anderson and boys’ team head coach and girls’ team assistant coach Dean Sawhill. Maybe destiny brought the two coaches together. Anderson started swimming at a young age, and knew by sixteen he wanted to be a swim coach. Sawhill followed the same path. Sawhill now teaches French and German at Black Hills High School. Anderson teaches at Jefferson Middle School, and coaches the robotics team. 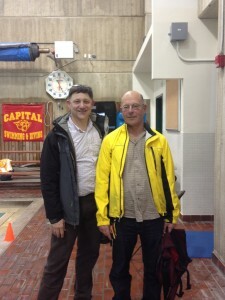 Coaches Burke Anderson (left) and Dean Sawhill lead the Capital High School swim team. Sawhill shares his favorite thing about coaching is watching his athletes grow. Anderson also enjoys the development of his athletes, but also has a real passion for the sport. He loves seeing the joy on athletes’ faces when they complete a goal, especially when it’s on their own. Different coaches have different ideas of what’s important and the CHS coaches have the refreshing view to not value winning above all else. Sawhill values team leadership and Anderson adds the chemistry from that leadership is just as important. And the teams have amazing chemistry among them. The boys and girls team are known for coming to each other’s home meets to help time races or to cheer each other on. When looking for a coaching home, Anderson chose Capital based on a pure gut instinct. He interviewed three times before securing the position, he recalls, and has embraced his position for close to thirty-two years. Sawhill has coached in Washington for thirty years and at Capital for sixteen following time at Bellevue and Olympia High School. Sawhill and Anderson agree the word “refreshing” sums up the CHS girls season. “There were a lot of new girls and a different attitude,” Sawhill says of the 43 member team. One of the new members, freshman Brooke Halpin, ate up the team and found the coaches engaging. “They would push and push and push you to your limits and really make you do your best, but if they saw you truly struggling with a set, they would help you modify it so you could continue to improve,” Halpin shares. She describes her coaches as fabulous. “They’re funny, dedicated guys,” Halpin says. She also recalls how Sawhill rode his bike to every practice wearing a beret, which certainly gave the girls something to laugh about. 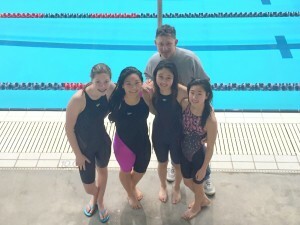 Halpin loves the swim team – they’re extremely supportive group of girls, no matter what. “The team always made sure that you felt like you just won your race, even if you crawled out of the pool dead last, and that’s a crazy awesome thing,” she explains. When looking at the CHS boys’ upcoming season, both coaches are excited. Anderson described the team as driven, and Sawhill thinks they’re charged. Senior captain Baily Young describes the coaches as dedicated and shares the many ways they help the team succeed. Sawhill and Anderson vary the workout schedule, making sure swimmers never get bored. They video tape all the swim meets so the boys can break down areas to improve. “This helps immensely, because we can see ourselves swim rather than just have to take the coaches word that, for example, our flips are too slow,” Young says. He also adds that the best thing about the team is the comradery they’ve formed. They cheer the fastest swimmer and a novice struggling to finish the same way – like they’re about to win Olympic Gold. Anderson knows that the teams are going to have highs and lows and they will find their way through. Sawhill encourages the teams to sit and talk when they’ve had bad days, using the independence and ownership the coaches encourage. The family-first style that Anderson and Sawhill employ impacts their athletes and the senior members make sure the younger ones understand the true definition of family. Sawhill and Anderson have a no-cut policy attracting a variety of swimmers and helping the teams get closer. Sawhill recalls his first year of coaching at Capital having a boy nervously approach him, asking if the no-cut policy was true. When Sawhill said yes, the boy shared he couldn’t swim. Sawhill initially began instructing him but as the season progressed, older members of the team began to step in and teach the boy how to swim. He wasn’t the best on the team, but by the end of the year, the boy was completing races and feeling proud. 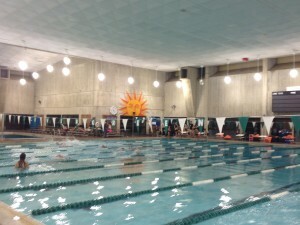 The boys and girls CHS swim teams practice at the The Evergreen Swim Pool. This sense of community remains with the team today. While teammates might not be teaching each other to swim, they still offer help. From teaching tricks to forming strong friendships, the swim team’s unique connection is hard to find or replicate. When asked why swimming is beneficial both coaches are quick to respond. Sawhill shares it’s not only fun but you’ll learn and grow in a skill you’ll have for the rest of your life. Anderson adds it’s a great way to connect with people and make friends both in high school and beyond. There are 86 swimmers on the Capital High School boys and girls teams. This gigantic number reflects on how the coaches work to make sure every member of the team is improving and loving the sport, no matter their skill level. It’s true the swimmers make themselves a competitive force, but it’s coaches like Anderson and Sawhill that make them a team.